To see how to shape the mum, watch the video at https://youtu.be/jJBwQyyza6g. Instructions: Create a 6" x 6" card base from white card stock. Locate 6" x 6" premade card panel for background mat as shown. Trim down background mat slightly smaller than card base to allow for a small white border around card front. Distress background mat and ink all edges using VersaColor Pine Cone ink. Adhere to card base using adhesive runner. Locate 6" x 6" premade card panel with circle image as shown. Using the Circle Basics Die, cut out circular portion of card panel. Using MISTI and VersaFine Black Ink, stamp sentiment onto circle image. Die cut the eyelet circle from the Eyelet Circle and Basics Small Die from white card stock. Adhere circle image to decorative eyelet circle die cut. Cut two of the decorative accent die cuts from the Festive Holly Die using die cutting machine and white card stock. Adhere to card base as shown. Adhere eyelet circle focal point to card base as shown using dimensional pop dots. Stamp three inkings of the largest peony blossom petals, as well as one inking of the largest peony and bud images from the Peony Bud and Blossom Cling Stamp Set onto white card stock using Magenta Hue Archival Ink. Stamp two inkings of the rest of the varying sized peony blossoms. Color using Stack and Store Daubers with ColorBox Cheeky and Memento Peanut Brittle. Die cut using coordinating dies and then ink petal tips lightly with Madder Rose Archival Ink. 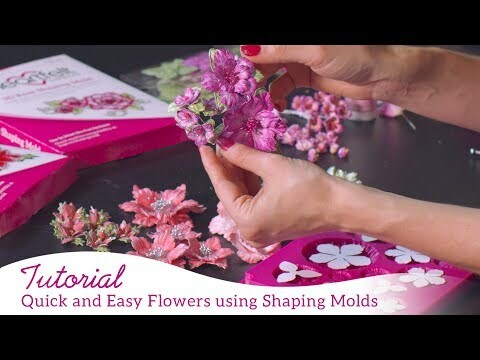 Shape flowers using 3D Basics Floral Shaping Mold. For full instructions on how to shape the Sweet Peony flower using the mold, please see video link above. Color peony bud and stamped floral image using same color combination as pieces for dimensional blossoms as well as Olive Archival Ink for leaf accents. Create one large peony blossom using three layers of each of the largest peony petals. Create one peony bud using four of the mid sized peony petal pieces. Lastly, create one small blossom using three of the smaller peony petal pieces. Shape stamped peony image slightly using flower shaping kit, and adhere large peony blossom to stamped peony image. Stamp several inkings of the varying sizes of peony leaves onto white card stock using Olive Green Archival Ink. Coloring using Fern Green and Leaf Green Archival Inks. Cut using coordinating dies and then ink around edges using Olive Archival Ink. Shape using Deluxe Flower Shaping Kit. Stamp two or three inkings of the small and mid sized peony blossoms onto white card stock using Memento Desert Sand Ink. Using Stack and Store Daubers, apply a light coloring of ColorBox Cheeky Ink. Cut using coordinating dies and shape using Basics Flower Shaping Mold. Create one mid sized Peony using two layers of each of the mid sized peony petal pieces. Apply flower stamens to center. Take seven of the smallest peony flowers and two of the next size up, shape using shaping kit and adhere flower stamens to centers. Adhere large peony flower to card bottom as shown. Shape peony bud stamped image slightly and adhere up alongside of the card. Adhere dimensional peony bud over top peony bud stamped image. Adhere lighter pink peony just under bud and the smallest of the dimensional peonies beside it. Adhere leaves into floral cluster in empty areas. Next add in small accent flowers where desired. For finishing touches, create gold loopy bow and adhere among flowers as shown. Glitter all dimensional flowers, and preprinted images on the eyelet circle focal point using a dries clear glue and Baby's Breath Ultrafine Transparent Glitter. Apply Nuvo Drops around sentiment as shown.